subroutine The Corp may draw 1 card. Then, shuffle 1 card from HQ into R&D. When does Mirāju's effect resolve? Does the Runner start running on Archives immediately upon breaking Mirāju's subroutine? When the Runner reaches step 4 of the run and would pass Mirāju, if they broke the printed subroutine they instead run on Archives and the Corp derezzes Mirāju. When the subroutine on Mirāju resolves, does the Corp have to draw a card in order to shuffle a card from HQ into R&D? No. "Then" does not imply any causation, it is merely an indicator of order of resolution. If the Corp does not have any cards in HQ and does not draw a card when the subroutine on Mirāju resolves, do they still shuffle R&D? No. The Corp cannot shuffle a card from HQ into R&D. A subtle card and not quite as bad as it may first look. Mirāju may have strength 0 but it's value is not in stopping the runner through subs but in taxing the runner. Essentially Mirāju is a question: runner, do you prefer the corp to optionally draw a card and (not optionally) shuffle a card from HQ into R&D or would you like to end the run? It doesn't say this on the card, but in effect running on archives is as good as ending the run (except if the runner wants to run on archives). Accept that the corp gets to draw and shuffle a card back in. In the case of Mirāju on HQ that probably means lowering the agenda density of HQ significantly. Try to make the corp too poor to rerez Mirāju and then run twice, once to break the sub and derez Mirāju and once to get through it. Kill Mirāju. While this is easy with cutlery or parasites it does waste a kill card on a low cost piece of ice. With most code gate breakers breaking Mirāju, and thus derezzing it, costs a credit and a click. It costs 2 credits to rez Mirāju. Since a click is worth more than a credit derezzing Mirāju costs more than rezzing it. If the runner has a money advantage that's not necessarily a problem, though it still costs clicks and that may hurt more than the credits. This calculation assumes however that there's no rezzed ice in front of Mirāju. If there is the story changes a lot. Assuming there's one piece of ice in front of Mirāju that takes 2 credits to get through the runner needs to spend 3 credits and a click to derez Mirāju vs the corp's 2 credits to rez it. It may be more appealing to the runner to let the sub fire. This however gives a huge advantage to the corp if done regularly. When building a deck around Mirāju be aware that there's synergy between Mirāju and Chief Slee that makes runner through Mirāju regularly a really bad idea. Especially in a kill oriented deck this is a scary combination. Mirāju does have some downsides to the corp. It can be difficult to keep rezzed if the runner is willing to break it repeatedly, those 2 credits per rez do add up And the second clause of the sub is unconditional, if the runner runs through Mirāju the corp has to shuffle a card from HQ back into R&D, even if it would mess up their plans. By the way if you're thinking of slapping a Sub Boost on Mirāju, that won't work. The special ability only works on the printed sub, not all subs. Overall Mirāju is a good cheap piece of ice for gaining an advantage through the actions of the runner and deterring all too aggressive running. When I first saw this spoiled, I was excited, as Mirāju looked like it was bound to be how Jinteki decks would mitigate agenda flood; but with some testing and the UFAQ, this potential really hasn't been met. Mirāju, as a piece of ice, only triggers if the runner actually runs it, which means if you draw into too many agendas, you need to hold onto them until the runner runs into it, which still leaves you stuck with the several turns of operating at minimal efficiency, as you are forced to do things in the wrong order, or just accept that you'll be discarding valuable cards. Mirāju looks like it was written to give the corp the choice of drawing and shuffling, or doing nothing; but the UFAQ says the corp doesn't need to draw to shuffle a card away, so you have to do so, no matter what. This is a pretty severe downside, as it if the runner has some multi-access, such as with Medium, or R&D Interfaces, an easily accessible Mirāju is a death sentence, as the runner can easily run into it to force a shuffle for fresh accesses. Primarily as a result of the shuffle not being optional, Mirāju is pretty low value on servers other than HQ. On Archives, the runner can happily break Mirāju, and laugh at you for even rezzing it, unless they are stuck with Black Orchestra, or you have a Crick or something in front of it. On R&D, Mirāju provides a way for the runner to get fresh accesses, especially if they have multi-access. On remote servers, you really want ice that can help you score your agendas, and this does nothing to help with that. Miraju doesn't do anything to stop the runner siphoning you into the ground, so you either need additional, normal ice on HQ, or you need other cards to help protect you from siphon, like Crisium Grid. Problem 5 - Install costs add up. Miraju is not as cheap as it appears, 2 credits sounds cheap, but it's not the whole story. Miraju, purely by being a piece of ice, adds to the install cost of other ice you install; which if you want 2 or 3 other ice on HQ, it will easily cost you an extra 2-3 credits. Miraju is pretty good for keeping you from losing agendas out of HQ, but it's value is so narrow that it's simply not practical to use for much else, and even for protecting HQ, some normal taxing ice is often going to be similarly helpful. This is further made worse by the fact that Miraju is the kind of ice you want to see early, but with only one good place to put it, including 3 of them is bound to result in not drawing suitable ice for other servers, or drawing them late game with more than enough ice on HQ already. You could probably run a couple of them in most Jinteki decks, but most of the time, two or three triggers of it won't be a real game-changer; and that's probably the best you are going to get. 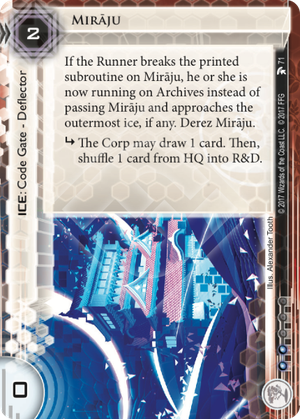 Maybe if Jinteki gets some kind of reasonably efficient ice-tutoring operation, then the situational downsides could be mitigated, but until then, maybe you'd rather just have a few copies of Mind Game, or something else taxing?